What Options Should I Consider for My Oil Skimmer? 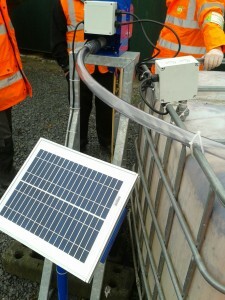 The solar oil skimming option is ideal for locations that do not have access or have limited access to electricity. A 12V DC motor runs off a deep cycle battery that is recharged by the solar panel. Various 12V accessories are available as well. This option is for applications in which the oil storage tank is far from the point of oil removal or for below ground applications. This turnkey system consists of a small collection tank, a pump, small control panel and three float switches. The oil that the oil skimmer picks up is deposited to the collection tank. When the collection tank is full, the middle float switch signals the pump to turn on. The oil is then pumped to your storage tank or facility for permanent removal or storage. Abanaki offers a float switch and warning light combination to monitor fluid level in the skimmed oil collection drum, which helps prevent overflow. Other electrical options include timers, heaters, and control panesl. Abanaki also offers poly shelters and discreet secure enclosures as well as a variety of mounting options for the oil skimmer. Abanaki Oil Concentrators® provide a secondary separation step after oil skimming to virtually eliminate water from skimmed product. Units are available for easy installation on most Abanaki oil skimmers. The Oil Grabbers have a variety of mounting arrangements design to make setup in even the most demanding applications a breeze. These include floor mounts, wall mounts, flat mounts, channel mounts, guard rail mounts and boom mounts. We love a challenge, so if you need something not mentioned let us know and we will do our level best to give you a great solution. For further inquiry on selecting the right oil skimmer for your application click below. As always, the Abanaki sales team is here, ready and waiting to help you choose the right oil skimmer for your application.